14K WG aquamarine & Diamond Ring,0.82ct diamonds and 4.260ct aquamarine. Wrap your finger with a bright, feminine look. Crafted in 14K white gold, this ring features a 11mm aquamarine in a four double prong setting. The center stone is bordered with diamonds, all in bead settings. There are also diamonds bead set on the twisted side band. 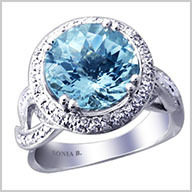 With a aquamarine weight of 4.2600ct and total diamond weight of 0.82ct (all approximate), this piece has a setting size of 9/16" x 9/16" and a height of 3/8"